RPG is a password generator that addresses the need for random passwords (and other random character strings) of specific lengths and constitutions. 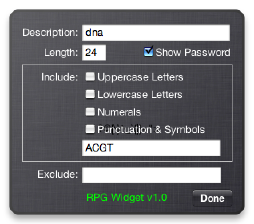 There are many password-generating utilities available, representing many different philosophies. RPG's design goal is to produce the most secure passwords constrained by the limitations — length and character set — imposed by the systems in which the passwords are to be used. RPG is most useful in concert with a keychain or password wallet. RPG allows you to choose the length of the password, the characters to include in the password and characters to exclude from the password. It can display bullets (••••••••) instead of the password, in case somebody is looking over your shoulder. And it lets you copy the password to the clipboard. Each copy of the RPG widget saves its password parameters and lets you enter a description, so multiple password parameter sets can be maintained by opening multiple copies of RPG in Dashboard. 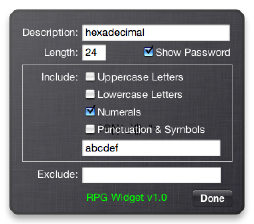 If you want to create a large number of passwords at the same time, or if you just want a non-widget version, you might prefer the RPG application. RPG is free for personal use. You do not have to pay anything for using it. Just try to be a good person; leave the world better than you found it. Specifically: work for justice, peace and sustainability; seek truth and seek to dispel ignorance and ideological dogmatism; recognize that the most fundamentally destabilizing influence in human society is the concentration of wealth and power; act out of love instead of fear. RPG is copyrighted, with all other rights (beside personal use) reserved. Commercial distribution is prohibited. You may not sell it or claim authorship of it. RPG (Widget Edition) v1.1.1 runs on Mac OS X 10.4 and later. If you are using Safari, click the download link. When the widget download is complete, the widget installer will appear. Click Install if you want the widget installed on your computer. If you are using a browser other than Safari, click the download link. When the widget download is complete, un-archive and open it to show the widget installer. Download: RPG.wdgt.zip (186.9 KB ZIP archive). Download David Rovics' song, R.P.G.